From late 2017 through early 2018, we invited those working in navigation roles in the U.S. to participate in a patient navigation compensation survey. In addition to questions on pay, survey respondents also provided information on their professional experience, the makeup of their navigation teams, training experiences, and more. It is our hope that the resulting data will provide much-needed industry benchmarks and serve as a useful tool for those serving in these critical roles. More than 400 navigators responded to the survey, including nurse navigators, social workers, lay navigators, care coordinators, navigation managers and more. Navigators from a wide range of health care facilities responded, though a majority of respondents are connected to or work in oncology due to many members of the Academy of Oncology Nurse & Patient Navigators (AONN) being invited and responding to the survey. 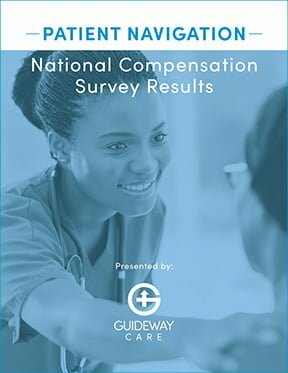 One of the most significant findings of these survey results is that nurse navigators typically command compensation rates that are higher than the national average for nursing,¹ and non-clinical navigators also have higher earning potential than most other non-clinical roles in health care.² The greatest predictor of compensation rates within this survey was whether the respondent possessed a clinical license, followed closely by years of experience. In addition, the survey revealed that two of the biggest unmet needs for new navigators are additional opportunities to shadow and learn from experienced navigators, and more well-defined onboarding processes overall. We hope that you find the following data useful. If you serve in a navigation role, we’d like to thank you for the critical role you play in improving patients’ health and experience within the health care system. ¹“Occupational Employment and Wages, May 2017: 29-1141 Registered Nurses.” U.S. Bureau of Labor Statistics, U.S. Bureau of Labor Statistics, 30 Mar. 2018, www.bls.gov/oes/current/oes291141.htm. ²“Healthcare Occupations.” U.S. Bureau of Labor Statistics, U.S. Bureau of Labor Statistics, 13 Apr. 2018, www.bls.gov/ooh/healthcare/home.htm.